Two cardinals on Valentine’s Day. What bird matches the colors of Valentine’s Day more than the Northern Cardinal, especially that bright red male cardinal? The female is a browner shade and it might seem unfair that the male gets to be so showy while she is somewhat drab, but the female sits on the eggs while the male flies around as a distraction to predators, literally risking his life to make sure his lady and the next generation are safe. On several occasions each spring I see a male cardinal run off to the feeder to get a sunflower seed and bring it back to his lady, offering it with a bow. One of these occasions happened to be Valentine’s Day a few years ago. Honestly, I’m not anthropomorphizing (interpreting animal activity by human traits), because I later read in an article about birds that this is a ritual that cardinal couples undertake during courting. 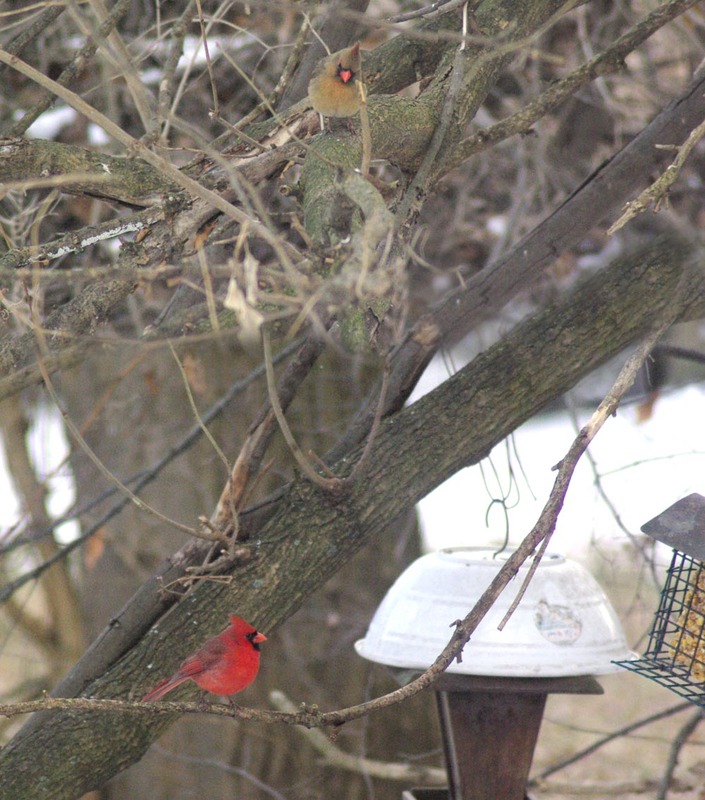 All birds are pairing off already, as these couples of cardinals demonstrate. This usually begins soon after February 2, that magic day when winter changes over to spring and all the creatures feel the stirring of the cycle, including the groundhog. The young cardinals have been showing off with spectacular aeronautics through the trees and all over the backyard, which is lower than my house so I get to see them flying right past the windows and from the top with the sun shining full on their feathers. On the morning above the male cardinal let the female eat first after what seemed some courteous encouragement on his part, then before I could photograph all birds disappeared as the Cooper’s Hawk landed in the maple tree. So much for the annual Valentine’s Day cardinal photo. The photo above is from 2012; I let PhotoShop combine the two photos I had taken of the cardinals because I couldn’t fit them into one shot. I’m not sure what it did with the missing tree branches, but at least the cardinals are positioned as they were, the male carefully considering which seed he would pull from the seed block in the feeder, his Valentine’s Day date eagerly awaiting above. Perhaps the two below are on a honeymoon since this was taken in summer. I wrote a poem about it after reading the explanation. Happy Valentine’s Day. I read this poem as part of my 2008 annual poetry reading and art exhibit, “Winter Twilight”. Read more poetry here on Today or visit my poetry page to see more about my poetry and other writing, and to purchase Paths I Have Walked, or read about it immediately below. For more information about these wonderful birds, start here and here, and to read about their habit of “mate feeding” read here. My Backyard Wildlife Habitat is filled with color in winter and summer and cardinals nest in my 70-foot spruce every summer—to see more photos of Northern Cardinals here on my photo blog Today, click here, and read about the annual Great Backyard Bird Count this weekend. Paths I Have Walked, collected poems. poems. I owe her many thanks for encouraging me to present this combination of my visual and literary art, a first for me. I love that building, every inch of it, and the opportunity to bring people in to visit is an honor. This entry was posted on February 14, 2015 by Bernadette. It was filed under backyard, birds, nature, outdoors, poetry, wildlife and was tagged with american cardinal, backyard birds, bird photographs, birds pairing off, cardinals, male and female cardinal, nature, nature photography, photography, poem, valentine's day. Pingback: The Creative Cat - Your Backyard Wildlife Habitat: It’s the Great Backyard Bird Count!